What has this got to do with woodturning ? I hear you say. The quote is from Sir Isaac Newton who, in a letter to his colleague, Robert Hooke, in 1676, is reputed to have said “If I have seen farther than others, it is because I was standing on the shoulders of giants”. I thought this quotation fitted the situation admirably in this case, as in many others we woodturners encounter, where we build on what we learn from others, develop our own angles on things and occasionally fly off at a tangent! The inspiration for this piece came from reading other articles on off-centre turning. I had a go at a few variations of candlesticks and vases and also expanded the experiment to multi-centre versions. Then my thoughts were led to what other things could be achieved with off-centre turning and I investigated the maths behind arcs as part of the process. The culmination of my efforts was a fairly simple formula that could be used to find the radius of an arc. To put this to the test, I thought about what would be the most extreme case and ended up with the double arc bowl. The same principles can also be applied to a piece with any number of arcs. The formula and an explanation can be downloaded here. You will need the acrobat viewer installed to read the document. One word of caution and another reference to Sir Isaac and his laws of motion – due to the mounting being significantly off-centre, this bowl calls for caution both in mounting and balancing of the piece. Also, remember to keep your fingers out of the way while it’s on the lathe! I selected a 15cm square by 7.5cm deep piece of London Plane (perhaps it should have been apple to fit in with the Newton theme! ), mainly because it was a square blank as opposed to a round one so I could use it corner to corner to get a larger final piece with less waste. I say it was 15cm square but in fact it was a little under that so I’m not sure if it was a 15cm blank that shrunk or a 12.5cm blank that was generously cut ! For a bowl of this type, a rectangular blank would be the ideal starting point but you can always use the offcuts for another project. Some initial measurements left me with about 20cm corner to corner and I thought an arc height of 5cm would give a reasonable shape to the piece. Using the formula, I found the radius of an arc to match those dimensions would be 12.5cm so I set about marking out the blank. 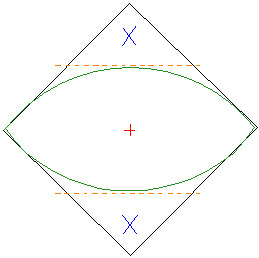 A pair of dividers were set to 12.5cm (the radius of the arc) and from the left and right corners as shown in the diagram, the centres of the arcs were marked (shown in blue). The dividers were used again at the same 12.5cm setting to mark the actual arcs (shown in green) from the arc centres just marked. The centre of the piece (shown in red) was also marked as the mid-point between the two arc centres. The centre mark was then used to drill a pilot hole to a depth of around 2cm with a small diameter drill to aid locating when mounting. It is useful at this stage to mark a line between the ends of the arcs, for use later in lining up the blank on the backing piece. The next stage was to cut off the excess wood outside the two arcs. I didn’t have the luxury of a bandsaw so I just did a straight cut across each side (brown dotted lines on drawing) to remove the bulk of the excess. Having done this once, I can say it pays to remove as much of the excess as possible so the balancing isn’t thrown out too far while cutting on the lathe. Remember not to cut off the excess before all your marking out is completed or you won’t have anywhere to draw the arc from!